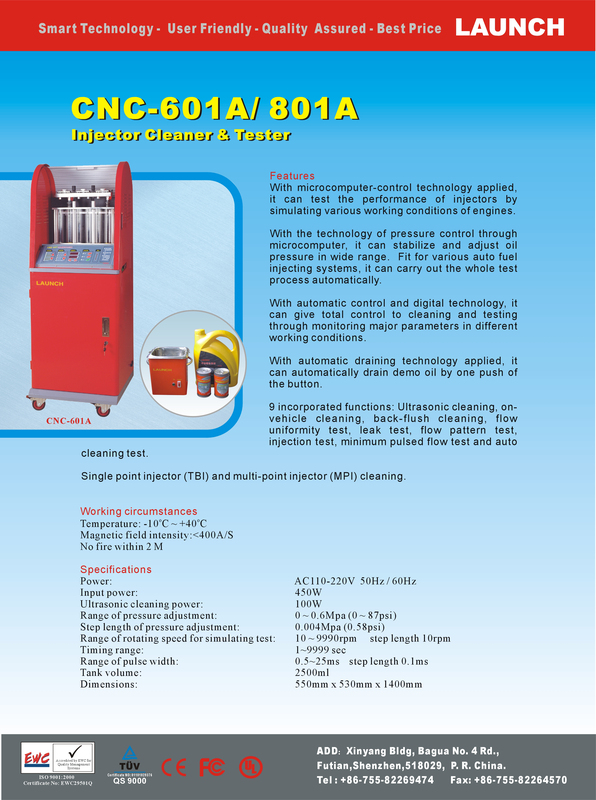 With the technology of ultrasonic and fuel pressure closed-loop controlled by microcomputer, Launch injector cleaner & tester CNC-801A is an advanced electromechanical product, which can clean and test various injectors of single point injecting and multipoint injecting by simulating engine working conditions. It can also clean the injectors and fuel supply system on vehicle. Ultrasonic cleaning: To clean several injectors at the same time by an ultrasonic cleaner and remove the carbon deposits. Reverse flush: To remove the impurities adhered to the injector or screen thoroughly. On-vehicle Cleaning: The unit is equipped with various adapters and couplers that may help clean the injectors on vehicle. Sprayability test: To observe the Sprayability status of each injector with the help of backlight. Leakage test: To test the sealing and dribbling conditions of injectors under high pressure. iUniformity test: To test the uniformity of injecting amount of each injector. CNC-801 User Manual Injecting flow test: To check the injecting amount of the injector in 15 seconds of constant injection. With microcomputer-control technology applied, it can test the performance of injectors by simulating various working conditions of engines. With the technology of pressure control through microcomputer, it can stabilize and adjust oil pressure in wide range. Fit for various auto fuel injecting systems, it can carry out the whole test process automatically. With automatic control and digital technology, it can give total control to cleaning and testing through monitoring major parameters in different working conditions. With automatic draining technology applied, it can automatically drain demo oil by one push of the button. 9 incorporated functions: Ultrasonic cleaning, on-vehicle cleaning, back-flush cleaning, flow uniformity test, leak test, flow pattern test, injection test, minimum pulsed flow test and auto cleaning test. Single point injector (TBI) and multi-point injector (MPI) cleaning.